You’re working very hard to keep a balanced lifestyle, whatever that means for you. when this card is pulled, it’s an encouragement to say you’re succeeding at your goal to maintain balance. This entry was posted in Artist, Deck Review, Featured Card of the Day, General Tarot, Readings and tagged 2 of Pentacles, Artist, Considerate Cat, Guidance, Madeleine Illustration, Path, Reading, Tarot. Balance, harmony. Cooperating instead of fighting, getting people allies. 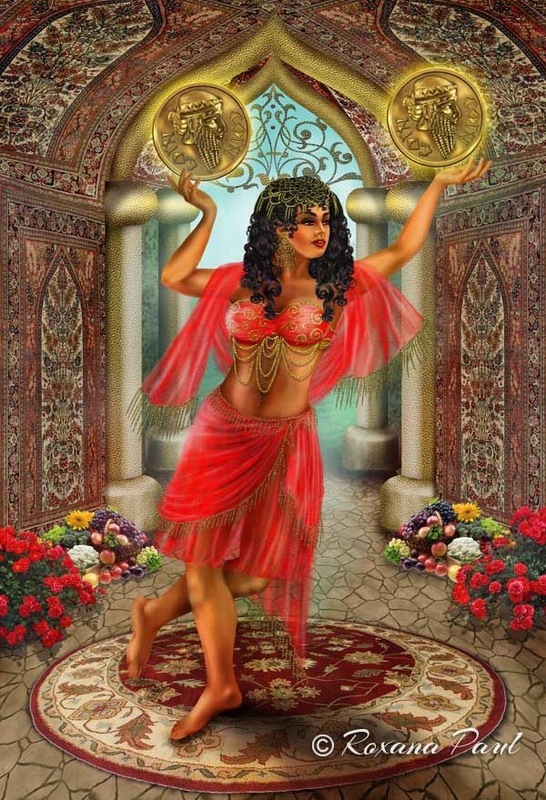 A beautiful belly-dancer in a red dress artfully balances two pentacles above her head. A spectator can enjoy her graceful movements while she is dancing. The belly- dancer is in a luxury chamber of a Babylonian castle surrounded by flowers on the floor. This entry was posted in Artist, Deck Review, Featured Card of the Day, General Tarot, Readings and tagged 2 of Pentacles, Artist, Guidance, New Babylonian, Path, Reading, Roxana Paul, Tarot. Today’s 2 of Pentacles comes to us from well-known Tarot artist, Paulina Cassidy. I believe she may have the most decks to her credit for an individual. If you are currently in the USA, and in the Tennessee region, you can stop by the Chattanooga Market on a Summer weekend and meet Paulina in person. She will be there with an incredible selection of decks and prints. So, let’s talk about the 2 of Pentacles, especially when it comes to balance. Venus has just entered home sign of Libra which is all about balance, and today Uranus begins its annual retrograde through January 6. Uranus is very much the choppy water you see in the background of a 2 of Pentacles card; it can be a bit chaotic at times. However, your main objective here is to go-with-the-flow. Keep your priorities straight at this time and maintain a balance between work life and home life. Think of yourself as clinging to a buoy and you just need to ride this one out; remember, a couple of days ago, the 6 of Swords was present, showing that any turbulence encountered will not last. For now, just keep on keeping on and don’t rock the boat. This entry was posted in Card of the Day, General Tarot, Patreon, Readings, YouTube Videos and tagged 2 of Pentacles, Card of the Day, Guidance, Path, Reading, Tarot. Trying not to rock the boat? Sometimes change can become a bit chaotic; after all, it is still technically eclipse season through the end of the month. You can navigate this by doing your best to go with the flow, and taking on the appearance of a buoy in a stormy sea. Strive for balance today. With all of the changes going on around you, you may have been neglecting an area of life which now requires your attention. Today can turn out to be the simplest of multitasking, such as laundry, errands, grocery shopping, having that presentation ready for Monday morning, and making sure your children are prepared to return to school on Monday or Tuesday, depending upon where you live. This entry was posted in Card of the Day, General Tarot, Love and Finance, Patreon, Readings, YouTube Videos and tagged 2 of Pentacles, Card of the Day, Guidance, Path, Reading, Tarot. Oh, how hectic eclipse season can be! Picture yourself as a juggler, who only just mastered two items in their juggling repertoire, only to have someone from the sidelines start tossing a few more in your direction! Welcome to eclipse season! With the 2 of Pentacles, being able to multitask efficiently, and to keep one’s priorities balanced, especially between work and home, seems to be the only way to be right now. Very often there is chaos (eclipse season), of sorts, taking place in the background, and the best way for you to get through it all is to master the art of going with the flow. This is not a time to resist the tides of change, lest you be swept up in them. Learn to adjust your sails as you go in order to stay the course. The two of pentacles, is about balance of earthly things – wealth, business, and communication most specifically. 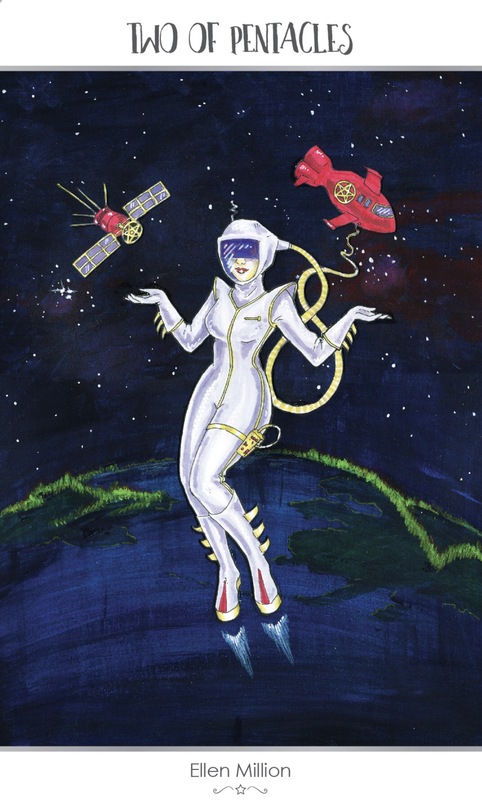 Here we have an astronaut who is balanced in space, indicating the rich-looking, pentacle-adorned space ship she is attached to, and a satellite, which represents communication and more spiritual needs. It can be a tricky balance, complicated even further by blazing rocket boots! The infinity symbol from the traditional Rider Waite deck is hinted at in the curve of her tether, implying that the figure in question can handle an unlimited number of problems. Below her, a cold-war Russia and Alaska face each other under aurora-lit skies, representing outside conflicts. In darkest space, a satellite and space ship orbit the Earth, illuminated only by the Northern Lights. Before them, a single astronaut hovers, her space-walk powered by rocket boots, and her safety assured by the conduit tethering her to the ship. A great distance is between her and the satellite, but she is unfazed, she knows her own power and how to rely on the equipment at her disposal…her ability is infinite, her life-line shows us as it curls into that symbol. 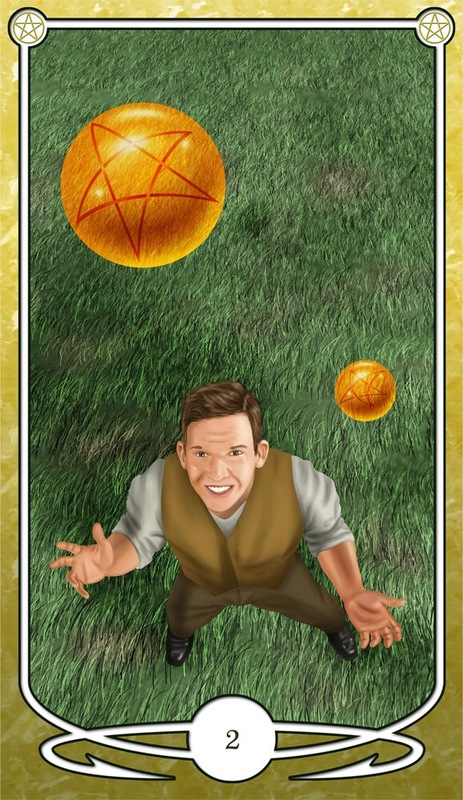 When this card appears in a reading, it is urging you to believe in yourself – yes, you’re being asked to perform quite a juggling act, but it’s nothing that you can’t handle. You’ll need to be diplomatic and flexible, remembering to manage your time carefully, and you’ll need to find some practical ways to achieve balance between your work and home life, but you can do it, AND turn this to your advantage. This entry was posted in Artist, Deck Review, Featured Card of the Day, General Tarot, Readings and tagged 2 of Pentacles, 78 Tarot, Astral, Tarot.